Learning Rx One-On-One Training Significantly improved Cognitive Skills After Injury. The results of a study published in "Journal of Neuroimaging" highlight the benefits of LearningRx’s ThinkRx one-on-one cognitive training program in improving cognitive skills in soldiers with moderate to severe traumatic brain injury (TBI) and acquired brain injury (ABI). In a chart review of a pilot study conducted with soldiers in a warrior transition unit (WTU) at a large Army base in the United States, researchers found statistically significant improvements in IQ score, long-term memory, processing speed, auditory processing and fluid reasoning with very large effect sizes. Gains were also noted in working memory and visual processing. Also noteworthy were the self-reported transfer of training effects to improvements in confidence, perseverance, attention and memory. The study, which was presented at the 41st Annual Meeting of the American Society of Neuroimaging, was led by Christina Ledbetter, Ph.D., Louisiana State University Health Sciences Center and Amy Lawson Moore, PhD, Gibson Institute of Cognitive Research. “Overall, eight of the 10 participants included in the analysis could be classified as ‘recovered’ and an additional two participants could be classified as ‘improved’ given their Reliable Change Index scores,” explains Dr. Moore. “These results suggest that the ThinkRx cognitive training program may be a viable intervention for targeting the cognitive skill deficits associated with brain injury.” A summary of the study, "Neuroimaging Outomes of a Cognitive Rehabilitation Training Program," can be found here: https://www.gibsonresearchinstitute.org/research-areas/research-summaries. Gibson Institute of Cognitive Research in Colorado Springs, Colorado, is the research laboratory at LearningRx World Headquarters. 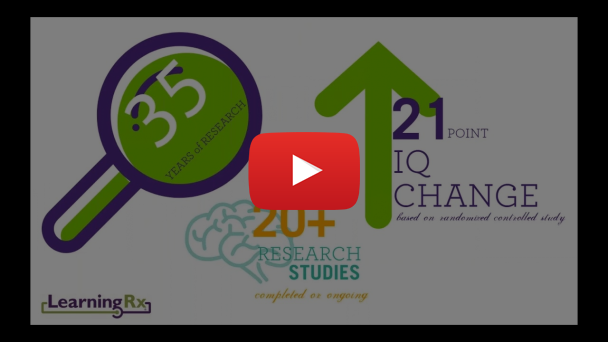 The mission of the Gibson Institute is to conduct empirical research on cognitive training programs and assessments, to communicate the latest research findings to the education and cognitive science communities, and to inform the practices of cognitive trainers through rigorous testing of training programs and procedures in both the laboratory and ecologically-valid training environments. LearningRx, headquartered in Colorado Springs, Colorado, is the largest one-on-one brain training organization in the world. With 80 Centers in the U.S., and locations in over 40 countries around the globe, LearningRx has helped more than 100,000 individuals and families sharpen their cognitive skills to help them think faster, learn easier, and perform better. Their on-site programs partner every client with a personal brain trainer to keep clients engaged, accountable, and on-task-a key advantage over online-only brain exercises. Their pioneering methods have been used in clinical settings for over 35 years and have been verified as beneficial in peer-reviewed research papers and journals. To learn more about LearningRx research results, programs, and their 9.6 out of 10 client satisfaction rating, visit http://www.learningrx.com.